You might accuse me of having a morbid sense of humor, but I can’t help chuckling a little at the funeral scene at the start of Braveheart. And I think you might just do the same thing after you see the meme I have created. Young William Wallace has just seen his father and brother killed, and he thinks he is all alone in the world. 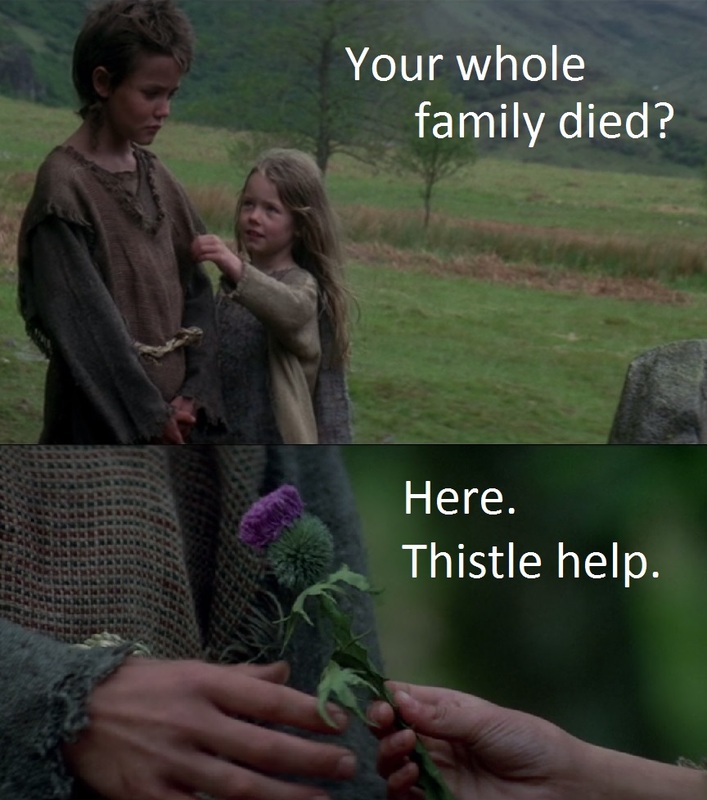 And then after the ceremony is over, a little girl tugs on his shirt and silently hands him a thistle. It’s a touching exchange, and the characters do all the talking with their eyes. But I decided to add a few words of dialogue for her character during this dramatic moment. These images are the copyright of their owners. This entry was posted in Joke of the Week and tagged braveheart, comedy, films, fun, funny, humor, jokes, movies, puns. Bookmark the permalink.